Sapogin Leo Georgy (1936) Mother--Pechorina Anna (1909), father--Sapogin Georgy (1905). Born on October 22, 1936 in Orel City, Russia; married on Dr. of Medicine Natsouk Vera; Father of Anastasiya (1977), Grandfather of Sonya Gol’tsova (1999). Now Sonya is most loved creature. Professor Sapogin now lives in Moscow, Russia. He began in 1954 to study in Taganrog Radio-technical University and graduated (Dept. of solid state physics) in 1959. He served during his military service from 1959 to 1972 at Ministry of Defence as the scientific adviser. Candidate of science (1966). He maintained (1971) the doctor degree in Leningrad State University. In 1972 to 1985, he was the Head of Theoretical Department in Russia Academy of Science. Since 1985 till present he is the Head of Physical Department of Technical University – MADI (Moscow Auto and Highway Construction Inst.). He is the author (or coauthor) of numerous (over 200) published scientific articles, 4 books, school supplies. He obtained (with V.Boichenko), first, very important scientific result: calculating (with accuracy more 0.3%) of the electrical electron charge and of the fine structure constant -1/137. 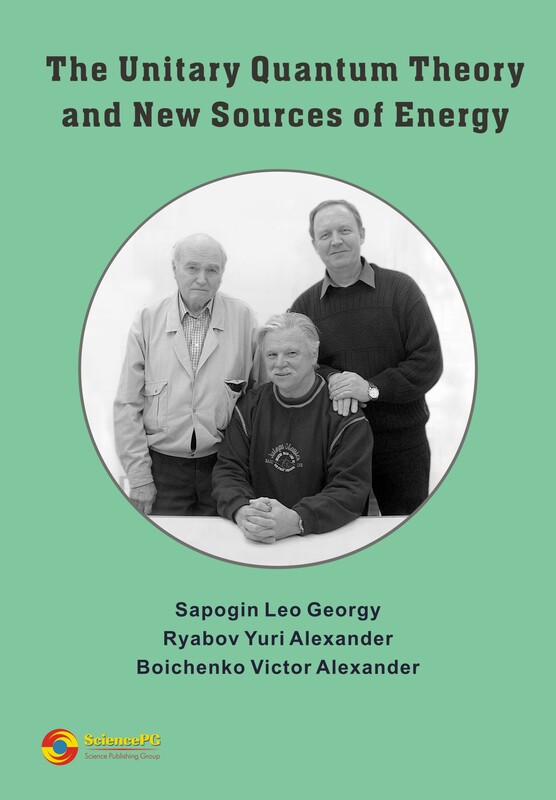 He published (2005) in USA and Russia (together with Prof. Yu.Ryabov and V.Boichenko) the book named “Unitary Quantum Theory and New Source of Energy”. Together with Ryabov he calculated mass spectrum of elementary particles and mass bozon Higgs - 131.7 GeV. Professor L.Sapogin - academic of Russian Academy of Natural Science and World Academy of Complex Safety. He was honored with 7 medals and Orders. In addition to his interests in science and classical music, Professor L.Sapogin has an interest in mountaineering. During 1956-1996, he had more than 200 ascensions in Caucases, Tyan-Schan, Pamir and Alps. His biography is included in collection books of Who’s Who in the World (2006), of International Biographic Centre, Cambridge (2009) and of American Biographical Inst. (2009). Ryabov Yuri Alexander (1923), academic (Russia Academia of Natural Science), Dd.Sc, Prof. Graduate 1950, Post-graduate 1953 (Moscow University, mech.-math. and phys. fac., astronomical sect.,dpt. Celestial Mechanics).Cand. Sc. 1953, Dr.Sc. 1963. Appointments: Junior Researcher (Moscow University, Astronomical Sternberg Inst.,dpt. Celestial Mechanics), 1953-1955. Docent (Moscow Energetic Inst. (correspondence), 1955-1960. Docent (Moscow University, Astronomical Sternberg Inst., dpt. Celestial Mechanics), 1960-1965. Head of dpt. Numerical Methods (Patrice Lumumba University), 1965-1971. Head of dpt. High Mathematics (Moscow Auto and Highway Construction Inst. ), 1971-1993. Professor of the same dpt., 1993 till present). Author (or coauthor) of 17 scientific monographs and more 170 scientific articles, wide Science-for Laymen articles and books, School-Supplies on theory and applications of diff. equations, numerical methods, astronomy (celestial mechanics), mathematical physics. Membership: Intern. Astronomical Union, European Astronomical Society). Order of Patriotic war and other awards as participant of World War II. His biography is included in collection books of International Biographic Centre, Cambridge (2010) and of American Biographical Inst. (2006, 2006, 2007, 2010). Boichenko Victor Alexander (1950). Graduate 1973, Moscow Phys.-Tech. Inst. Post-graduate student of Russian Science Academy (under leadership of Prof. L.G. Sapogin), 1973-1976. The scientific researcher of the complex Scientific Inst. (Russian Science Academy) in Khabarovsk, 1977. The scientific researcher of Inst of Control Science (Russian Science Academy), 1978-till now. Author of over 50 scientific researches. He developed together with L.G. Sapogin the bases of Unitary Quantum Theory and calculated (for the first time in physics science) the Fine Structure Constant and theoretical value of elementary electrical charge with precision 0.3% (in comparison with modern experimental value). The book proposes the model of the unitary quantum field theory (UQT) where the particle is represented as a wave packet of some unified field. The frequency dispersion equation is chosen so that the packet periodically appears and disappears without changing its form. The envelope of the process is identified with a conventional wave function. The equations of such a field are nonlinear and relativistic invariant. With proper adjustments, they are reduced to Dirac, Schroedinger and Hamilton-Jacobi equations. The numbers of the new experimental effects are predicted both for high and low energies. It is calculated with big precision mass spectrum of the elementary particles and the fine structure constant. Also theoretical mass of the Higgs bozon-131.7 GeV was calculated. UQT explains the existents of the low energy nuclear reactions, of other exceptional phenomena and the possibility to create new sources of energy, for example E-cat Andrea Rossi.